Nothing stirs tales of “wild” Appalachia quite like the mention of “painters.” This article was written before a DNA study of cougars – that may change the way biologists think – in terms of race and/or subspecies of Puma concolor. We will catch up with the catamount again in this book. There is a place in the human psyche that longs for wild. We can’t qualify or quantify it. We can’t quite put or finger on it. But all we have to do to recognize it is pull our sleeping bag over us and watch the last red ember from the camp fire die. And there we are a part of the wild Appalachian night. While we share that night with the bear, raccoon, owl and deer that dances in the moonlight, that wild place is thinking about cougars. Catamount, cougar, panther, painter, puma or mountain lion — the large cat is the stuff of legends in the East. It seems to come by its place of reverence honestly. Before Europeans, the Cherokee who shared the eastern forests with the big cat called it “klandagi,” or lord of the forest. For the Cherokee, the cougar and the owl were the only two animals to reach the seventh or highest level of purity and sacredness. While Europeans didn’t regard this animal with the same type of reverence, they did, regrettably, focus much attention on it. For Anglos in the New World, cougars were something to fear and loathe. And for many that is still a part of what makes wild things wild. 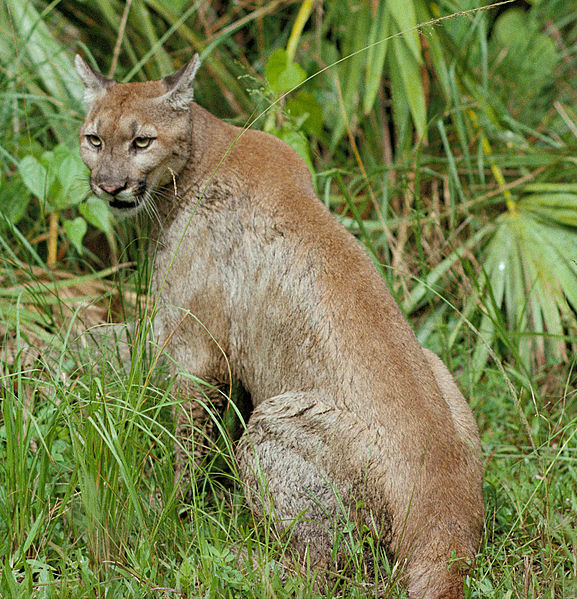 Like most legends, the cougar myth is based on a real animal, Puma concolor. This large wild cat once graced most of the Americas with the exception of the arctic. Before the arrival of Europeans, cougars were present in what is now the 48 lower states. There were at least 29 subspecies of the big cat. The eastern cougar, Puma concolor cougar, ranged from New Brunswick to the southern Appalachians. A small population (about 60 animals) of the Florida panther, Puma concolor coryi, still hangs on in the southern part of that state. Depending on which biologist you talk to, the eastern cougar was either extirpated or nearly extirpated from the eastern states by the early 20th century. The last confirmed wild cougar in the Southern Appalachians appears to be a specimen killed in Spence Field in the Smokies in 1920. The cat was killing sheep and when it was examined was found to have been in very poor health. There appears to be a documented cougar from Louisiana as late as 1965, and I have personally seen one in Louisiana in 1969. Of course, no way to know if the cat I saw was a wild eastern cougar or a released or escaped western subspecies. The disappearance of the eastern cougar is blamed primarily on habitat destruction and the decimation of their primary prey base, white-tailed deer. Of course once the deer were gone cougars began to prey on livestock and the few remaining were vigorously hunted, trapped and poisoned. There are no records for the eastern U.S., but from British Columbia, to California and Arizona, bounty hunters, federal hunters and sport hunters killed more than 65,000 cougars between 1907 and 1978. Even with that type of persecution, western cougars still maintain a viable population. In fact, they are still hunted legally in about a dozen states, including Texas. In one year (1989-1990) more than 2,000 were legally killed. A growing number of biologist are beginning to believe that a few eastern cougars could have persisted in remote areas. Chris Bolgiano is a writer, adjunct professor and vice president of the Eastern Cougar Foundation. Bolgiano and her associates believe they have documented 12 verifiable records of cougars in the eastern U.S. between 1976 and 2000. These records include July 2000, when a healthy male cougar was killed by a train in western Randolph County, Ill. This animal was a healthy 4- to 6-year-old male with normal claws and no tattoos. Tattoos and the absence of claws are signs of released captive animals. A cougar was treed and killed by hunters in Missouri in 1994. And a home video of a cougar was obtained from Western North Carolina in 1991. Bolgiano and the Eastern Cougar Foundation are not ready to go out on a limb and claim that eastern cougars inhabit more than our psyches. But they do feel that they have collected enough evidence to ask the question.